What does NBPU TIS do? The NBPU TIS has been established to provide tailored support to organisations funded under the national Tackling Indigenous Smoking programme. The NBPU TIS is not expected to assist with organisational matters such as business administration or governance. We are pleased to advise you that Brad Brown has accepted the role of Chair of the NBPU TIS Advisory Group. My blood line is Gunditjmara which is located in Western Victoria. Being proud of my Aboriginal and Irish descent, I have strong family, community and cultural values. 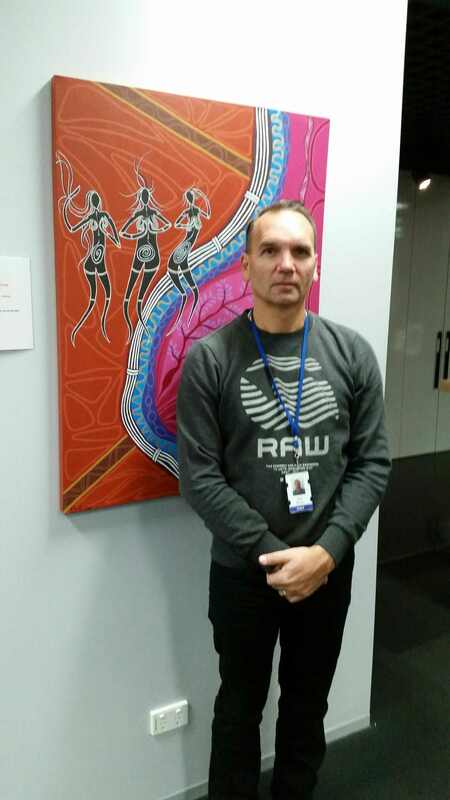 I have over 30 years’ experience in Aboriginal health, working within the Melbourne Aboriginal community as an Aboriginal Health Worker for 22 years. After that, I had more specific roles which included working in tobacco for the last 10 years and with all my experience, I have seen the massive impacts that tobacco has on our health. This has led to representation on a state and national level. I’m currently Aboriginal Prevention Program Manager at Cancer Council Victoria working with Quit Victoria and cancer preventions. This work is so important for our communities in improving better health outcomes. In all I do, I share my knowledge with my children, grandchildren and younger Aboriginal people, building strong relationships and securing our future generations . The National Best Practice Unit for Tackling Indigenous Smoking (NBPU TIS) Advisory Group provides strategic recommendations to the NBPU TIS in relation to assessing and synthesizing evidence to support tobacco control and health promotion for Aboriginal and Torres Strait Islander people and communities and effective engagement with TIS regional grant recipients; and provides a forum for sharing information, facilitating linkages and disseminating information and advice. Members of the NBPU TIS Advisory Group include a mix of experts in tobacco control as well as representatives of key organisations: the National Coordinator for Tackling Indigenous Smoking (Professor Tom Calma), the National Aboriginal Community Controlled Health Organisation (NACCHO), two TIS grant recipients, researchers with expertise in Indigenous tobacco control, relevant staff from Cancer Councils, state-based program and policy practitioners, the TIS national program evaluator (CIRCA), the Department of Health and representatives of the NBPU TIS consortium members. Rod Reeve, Project Director NBPU TIS and Managing Director Ninti One, chaired the meeting, with secretariat support from within NBPU TIS. The NBPU TIS Advisory Group met in Adelaide on 10 May 2016, prior to the first TIS national workshop. The NACCHO representative apologised that he was unable to attend. The Victorian Aboriginal Community Controlled Health Organisation and the Aboriginal Health Council of Western Australia participated in the meeting both as representatives of State and Territory Aboriginal Community Controlled health peak bodies and as TIS grant recipients. The meeting was the first time that the Advisory Group had met face-to-face, so members spent some time introducing themselves and describing how they could support the NBPU TIS. They agreed that it is important to share outcomes from meetings with the broader TIS community and asked the secretariat to draft a short summary for wider distribution after each meeting. Discussion at the meeting focused on the approach that NBPU TIS is taking to identifying and presenting evidence and evidence-based practice for use by TIS regional grant recipients. Professor Rachel Davey and A/Professor Penney Upton from the Health Research Institute, University of Canberra, who are leading the identification, analysis and synthesis of evidence for the NBPU TIS, described their search and analytical techniques for including material and practice in the NBPU TIS evidence base. The Advisory Group supported the approach which includes emerging evidence and practice-based evidence as well as scientific or ‘strong’ evidence. The process of translating and disseminating the evidence for application within TIS programs was agreed to be a key priority for the NBPU. Professor Neil Drew, Director of the Australian Indigenous HealthInfonet introduced the rationale underpinning the development of the NBPU TIS portal, focusing on working with TIS grant recipients to build an online knowledge centre for TIS that users test, contribute to and share within their community of practice. The portal is a living site that will house the evidence base for TIS, and which can be used in conjunction with other tailored support available from NBPU TIS. Discussion highlighted the opportunities available through the interactive components of the portal including ‘promising practice’ where organisations can contribute information about their experience; and ‘yarning spaces’ for peer-to-peer discussion and specific themes and topic. The Advisory Group also emphasised the importance of using language and communication channels that work for TIS workers who are the key audience. The Advisory Group also considered the NBPU TIS annual action plan, which sets out how NBPU TIS intends to provide tailored support to TIS regional grant recipients. The Advisory Group was satisfied that the plan had appropriate breadth and content, with the key challenge being delivery/implementation. NBPU TIS described the format and expectations for the forthcoming national workshop, and Anne Redman from CIRCA introduced the Advisory Group members to the national performance indicators and draft monitoring and evaluation framework. The next Advisory Group meeting will be held by teleconference in mid-late August. Welcome to all Tackling Indigenous Smoking (TIS) Workers. This Yarning place is for you to network with each other, have conversations, post interesting news, ask questions, give advice.....the options are endless. You can connect with other TIS Workers from all over the country (Internet connections permitting), knowing that you all have the same interest in improving the health of Aboriginal and Torres Strait Islander people by helping them to quit smoking. Go for it !! 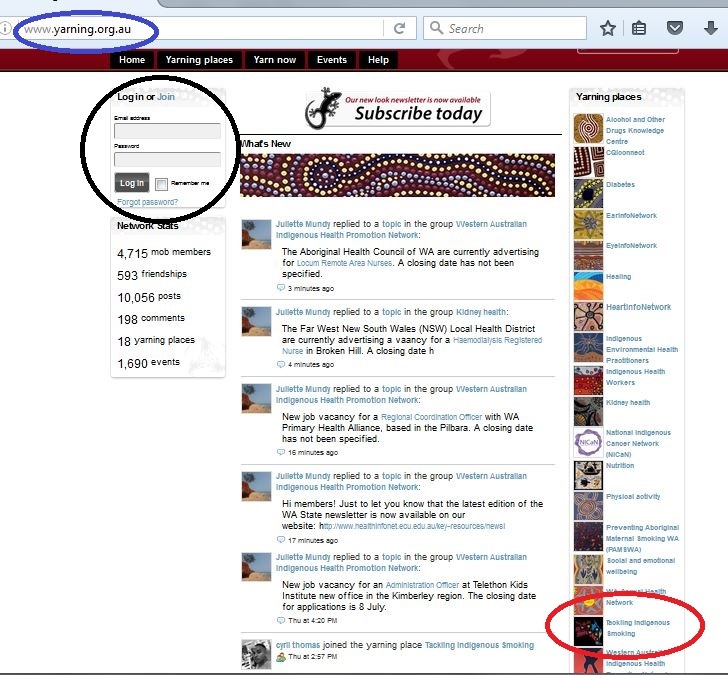 Join now by registering at Tackling Indigenous Smoking http://www.yarning.org.au/ and follow the prompts. Please contact info@tacklingindigenoussmoking.com.au or 1800 282 624 should you require assistance. Cancer Council SA provide smoking cessation training across Australia for those who work with Aboriginal and Torres Strait Islander people. 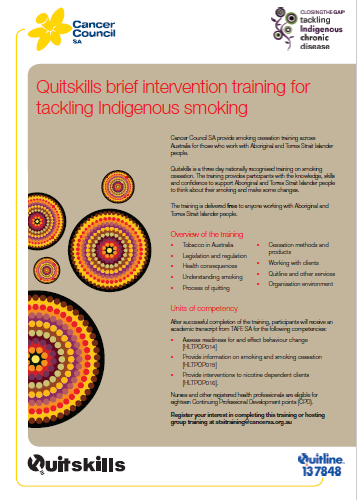 Quitskills is a three day nationally recognised training on smoking cessation. The training provides participants with the knowledge, skills and confidence to support Aboriginal and Torres Strait Islander people to think about their smoking and make some changes. The training is delivered free to anyone working with Aboriginal and Torres Strait Islander people. Copyright © 2016 Ninti One Ltd, All rights reserved.